Crowns are restorations that are used to improve a tooth's shape, aesthetics, and strength. Crowns are most often used for teeth that are broken, worn, have portions damaged by tooth decay, or have been determined by the dentist to be too compromised to be restored with another filling. 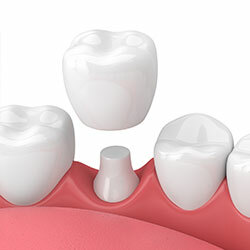 Crowns or "caps" are either cemented or bonded onto an existing tooth; they usually fully cover the portion of the tooth above the gumline. In effect, the crown becomes the tooth's new outer surface. Crowns can be made of porcelain, metal, or both. Porcelain crowns are most often preferred because they mimic the translucency of natural teeth and are very strong. Unlike a filling, which is restored directly in the tooth, a crown is fabricated indirectly outside of the mouth; it is created in a lab from a unique tooth impression which allows a dental laboratory technician to examine all aspects of your bite and jaw movements. The crown is then sculpted so that your bite and jaw movements function normally once the crown is placed by the dentist.